Malcolm Butler played the role of shutdown corner today, as he was pretty much never heard from the entire game. The Jets weren’t targeting him at all save for a few times in which he had great coverage and there was no completion. He also sniffed out a third-down swing pass in the fourth quarter that he was able to stop behind the line of scrimmage and force a punt. Jayon Brown was fantastic at linebacker for the Titans today. He made a handful of big defensive stops in the run game that helped set up second and third-and-long situations. He also was fantastic in coverage, making a big pass breakup and playing tight on his man or in his zone all game long. Josh McCown rarely looked his way because of that coverage. Marcus Mariota got off to a poor start early on, throwing a pick-six to Trumaine Johnson to give the Jets a quick 10-0 lead not even halfway into the first quarter. It took some time, but he eventually got things turned around, hitting on a few really impressive deep passes. The play that best sums up his performance was his best scramble of the night on the final drive, forcing two missed tackles only to fumble the ball. Miraculously, he recovered the fumble and capped off the drive with a game-winning touchdown pass, doing just enough to help earn the win. It was not a great day for the Titans’ offensive line. They combined to get called for six penalties and didn’t give the Titans’ running backs much room to run. Ben Jones was also forced to slide over to left guard, where he fared fine, but Corey Levin filling in at center seemed to have more issues than Jones was having prior to the switch. The Jets’ offensive line didn’t get anything going in this one. The Jets ran a bunch of play-action rollouts simply because there was a good chance McCown would be pressured if they didn’t. Running the ball was even more of a struggle, as the Jets’ duo of Isaiah Crowell and Elijah McGuire had to create almost all of their yards on their own with little line help. McCown was his usual up-and-down self in this game for the Jets. They schemed plenty of open throws and easy reads for him, but he also hung in the pocket under pressure and made tough throws. But when it came down to it, he badly overthrew his receiver on the final play for an easy interception by Titans’ Butler. Henry Anderson saw his most playing time of the season and really gave the Titans’ offensive line fits at times. He had two sacks that were nullified because of penalties elsewhere and forced a holding penalty on Taylor Lewan, in addition to a couple other pressures. It was a day for cornerback Morris Claiborne, arguably his worst outing of the season. He was called for three penalties and also gave up two big pass plays to Taywan Taylor and Tajae Sharpe. 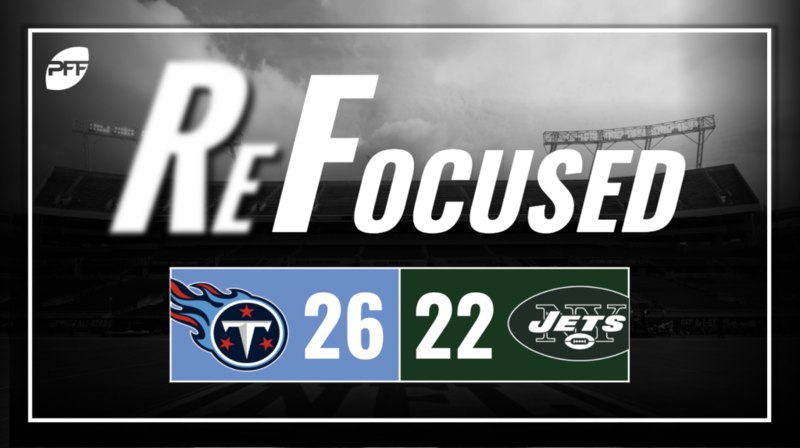 It was a slow start for the offense that featured quite a few mistakes but got things going in the second half with 13 points in the four quarter to solidify the win. The Jets’ offensive line struggled to establish anything up front, and McCown just couldn’t make the throws he needed to make to both hold onto the Jets’ late lead and then regain it once they lost it.